Why You Should Be Using An Oil. Even though facial oils are in the spotlight and very much having their moment, I notice a lot of people are still quite cautious introducing them into their routine, especially those with oily skin, instead reaching for an 'oil-free' moisturiser or alcohol-laden toner to treat their skin issues. There seems to be a common fear that oils are going to break you out or make your skin greasy. This isn't true! If you take the time to learn about the oils you're applying to your face, then there is no reason why they can't transform your skin for the better! Don't be sold by the name on the bottle, always read the ingredients list! Oils are made up of a series of different fatty acids, our skin needs fatty acids to keep itself well hydrated and nourished, and since our body can't make fatty acids using a face oil is a great way to get these fatty acids onto our skin. Face oils also create a lipid barrier over the skin which can speed up healing, as well protecting the delicate acid mantle and helping protect skin from environmental damage. Besides keeping skin balanced and hydrated there are some oils such as jojoba oil which are so similar to our skin's own sebum that they trick our skin into thinking it has produced enough oil and keep oily skin balanced! Because the molecules of the oil are so small, it also works deep down in pores and dislodges any dirt lurking... such as blackheads. Ah-mazing. Read this! - My post on Oleic vs. Linoleic acid. The different fatty acids in oils make all the difference to dry or oily skin types. 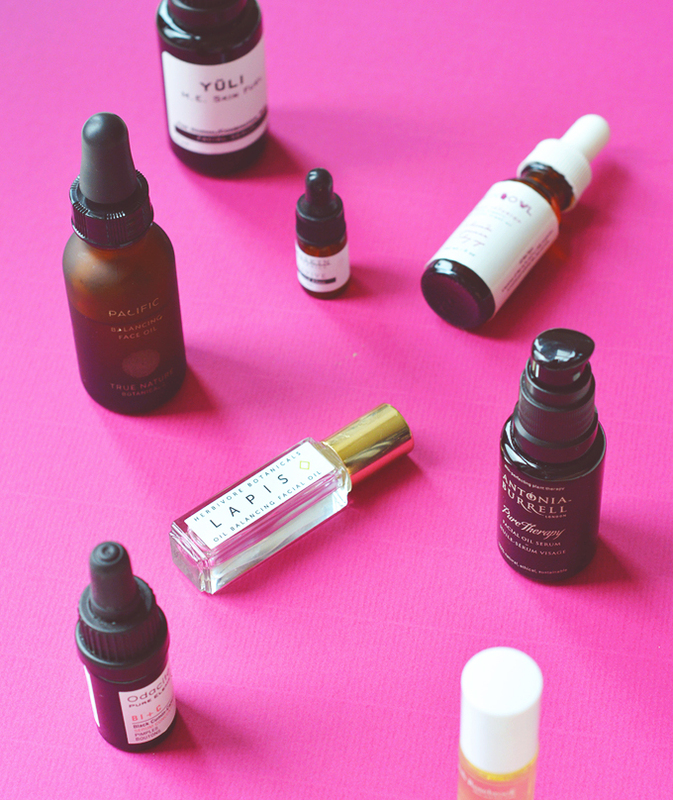 Find out which individual oils are PERFECT for your skin type. Picking the wrong oil can lead to clogged pores, greasy skin and maybe even... spots. Gasp! High-Quality Oils - This is so important! The cheap facial oils from drugstore brands may be filled with filler ingredients, fragrance, heavily refined oils that are no longer packed with nutritional skin benefits and irritating preservatives. Facial oils are one of the areas I recommend investing in, save on your cleanser but spend a few extra pounds on your facial oil for something of a higher quality (I would also recommend choosing a natural, ethical brand that uses organic ingredients for the absolute best oil - this doesn't have to cost the earth, there are some amazing budget natural brands that still use the best ingredients). Oils are potent and you only need a few drops to get the full benefit. I would recommend starting with small amounts of just 2 or 3 drops and adding more as and when you need it. Pay attention to your skin, dry skin could gladly slurp up 5-7 drops of oil whereas applying that much to oily or combination skin is counter productive and may just leave you with a greasy face. To help your oil absorb QUICKLY into skin spritz skin generously with toner so it's nice and damp and then massage the oil into skin, the water helps the oil penetrate faster and easier. I apply just 1 or 2 drops mixed with a water-based serum in the mornings and then in the evenings 3 to 4 drops is the perfect amount for my combination skin. Making sure to apply to damp skin was a game changer for my facial oil application. 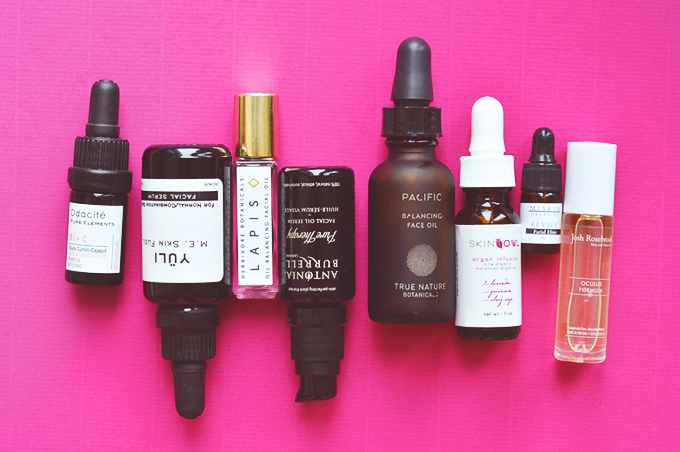 As long as you read this post you'll know what to look for when searching for the perfect facial oil blend. You can also pick up individual oils and introduce them that way, which is probably better if you're not used to oils before, there's less chance of overwhelming skin. My go-to's would be Argan Oil, Avocado Oil or Rosehip Oil. And that's all you really need to know! I hope this helped anyone who hasn't tried a facial oil before see that they're not quite so scary, and anyone who has tried them but isn't sure what the difference is between oils... there's quite a few!